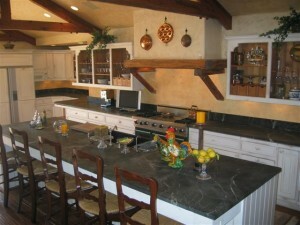 About three years ago, Bob and I remodeled our kitchen. Since we have an older home, 1935, we wanted the kitchen to be updated and modern but also to complement our home. Soapstone has a reputation for being old-fashioned. After all, it was common in homes, particularly in New England and has been used for a couple of centuries. There are many homes in New England where the 100+ years old soapstone is still stands. There really is nothing quite like soapstone. It’s extraordinarily beautiful and possesses remarkable stability. Soapstone develops its own personality. So, after doing much research and many nay sayers comments, we had soapstone installed. I love everything about it and am happy we made the choice to go that way. As a bonus, it’s the most environmentally friendly counter top available because from taking it from the quarry to preparing it for the consumer, near zero impact on our planet.